Flicka von Hannover thought she had it all. She married a handsome and powerful man, the crown prince of Monaco. Her wedding day was the event of the century and her charity cases gained several millions on that day alone. Flicka and her brother are used to the dangers that come with living in the spotlights and they have heavy security around them at all times. Soon after her marriage Flicka finds out that her husband isn't who she thought he was. His indiscretions are out of control and Flicka can't take and won't accept this behavior any longer. Her husband has always made it very clear what he needs from Flicka. What will he do when she's nowhere to be found? Flicka married an, on paper, appropriate husband and she thinks love is logical. You can love someone in many different ways and Flicka thinks she can handle the fact that her husband constantly cheats on her. When he becomes violent towards her Flicka runs to the only person she trusts with her life, her personal bodyguard Dieter. She loved him once until he decided he couldn't lie to Flicka's brother any longer. Will Dieter be able to keep Flicka safe? Once Upon a Time a heartbreaking love story about a princess who keeps herself away from finding true love. Flicka has a big heart and will spend all of her money on charities if she has the chance. I loved her kindness and my heart was aching for her, because she's a young beautiful woman who thinks she has to stay in a loveless marriage. Flicka is kindhearted and would do anything for anyone who needs it, but now the time has come for her to put herself first. She's fiery like a warrior princess and I was hoping for her to find true love again. Blair Babylon writes about family in a wonderful manner. Flicka and her brother are fierce and they have a strong bond. I have a deep connection with my own brother as well, so it was easy for me to feel close to Flicka and her brother. Ever since I was a young girl I've loved to read stories about royal families. I always imagine how fantastic life would be living as a princess. Blair Babylon makes her princess come to life in a great way by giving her such an amazing personality. Once Upon a time is a gripping story about royal families, secrets and dangerous encounters. It is the first book in the Runaway Princess series and I absolutely can't wait to start in the next episode of Flicka's journey. If you love to read stories about royal families, secrets and dangerous encounters I think Once Upon a Time would be a perfect choice. Please keep in mind that this book has an open ending and that the story will continue in the next book. Hi! 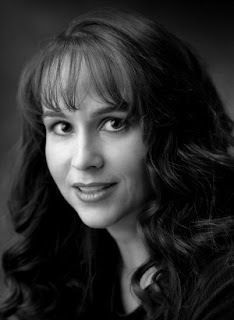 I'm Blair Babylon, and I write contemporary romance novels about hot royals who fall in love with normal people. I used to write literary novels under a different name, and I almost gave up writing entirely. Just as a last ditch effort, and just as independent publishing became a thing, I wrote the Wulf and Rae book, Billionaires in Disguise: Rae and tossed it up at the ebook stores. It was fun to write. I liked writing about people who fell in love and ended up happy. (So different than literary writing.) And readers liked it! And people wrote to me and wanted more! Romance readers saved me as a writer. I had been ready to quit, and now I absolutely love to write again. 2) What makes your heart beat faster? I won't lie. Hot men. I like them. 3) Do you have a specific writing routine? Sort of, but it's mostly any time that I can. I'm homeschooling my 8th grade kid. Right now, he's doing Algebra review while I work on administrative tasks. Later, when he's working on something less hands-on, I will get on Facebook with some of the other writers with whom I write in a chat window, and we'll do writing sprints. I write late at night a lot while my husband watches television. He pokes me to show me the good parts. 4) Can you describe the main characters of Once Upon A Time in seven words each? HRH Bossypants wants to change the world. Her hot bodyguard tries to save her. True love. That's a big concept. Wanting to jump each other's bones is an important part of it, especially at the beginning, but the most important thing is to value the other person so highly that you put them ahead of yourself. That kind of mutual sacrifice and lifting each other up is the basis for true love. 6) What's your favorite quote and why? The first one that came to mind was "Never give up; never surrender," from Galaxy Quest. I know it's silly satire, but sometimes you have to bull your way through life. Also, for the internet, "Not my circus, not my monkeys." I wrote Little House on the Prairie fanfic in second grade. I kid you not. I've been writing books and stories ever since. I typed the first draft of my first novel on an honest-to-God IBM Selectric. Even though I majored in microbiology in college, I took a lot of creative writing and literature classes, as many as they would let me. I also hold an MFA from the University of Iowa, where I was the Truman Capote fellow. But really, it began in reading books. I have always loved to read, and I have always read widely, including a lot of genre novels. I read romance novels all the way through high school and college, after my mom got me started with Gone with the Wind and Forever Amber. Then Jude Devereux. 8) If you could be a princess for one day what would you do? I like how Flicka throws charity events. I'd throw a huge charity event that everyone just had to attend, and I'd raise a buttload of money for some important charities. 9) What is your favorite fairytale and why? They're all so pivotal in romance, it's hard to pick one. Probably The Frog Prince, because the princess has agency and decisions in that one. I like Snow White, too, because the princess fends for herself and works hard (keeping house for the dwarves) after she escapes from the castle. More books! After the Flicka series is finished, I'm working on an unfinished series, the Runaway Billionaires. The next book up is Maxence, the younger brother of the Prince of Monaco. After that, I've got another great series planned: Rogue Security. 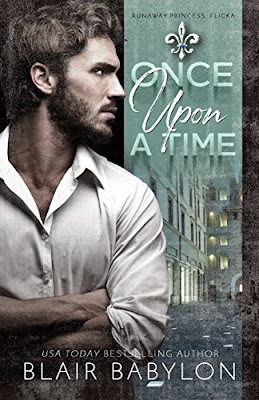 One very Lucky reader of With Love for Books will receive a $20 Amazon gift card and a signed paperback copy of Once Upon A Time by Blair Babylon. Once Upon A Time sounds like a wonderful tale of friendship, love, heartbreak and betrayal with plenty of thrills and suspense. Forever Amber? Goodness, I haven't heard about that in years! I love that street shot on the cover! This sounds like such an amazing read! I love the title and the cover. I certainly hope Flicka von Hannover will find peace and romance! Great interview. I love reading about the authors. I really like the cover! I'd love to read this! Sounds great, thanks for the review & giveaway! Man, could you even imagine being married to the prince of Monaco? Sounds like a great read. Sounds like an amazing read. I love the cover! I'd enjoy reading this book for sure. It sounds a really interesting book. Nice title and cover! Congrats on the tour and I appreciate the review, interview and the great giveaway as well. Love the tours, I get to find books and share with my sisters the ones I know they would enjoy reading and they both love to read. Thank you! I cant wait to read to dive into this awesome read, and the cover is so hot! This sounds like an intriguing book, I'll be checking it out. Adding this to my TBR pile. Can't wait to read it. Sounds amazing! I'd love to read it. Sounds very topical at the moment! Would love to read. i love the cover, sounds great! This sounds like such an interesting take on a love story. Congrats on the book. I love that you wrote Little House fanfic!!! Awesome. Ohh, what the heart wants, what it tries to want, what it thinks it should want, what it tries to not want, what it knows it's not supposed to want... It sounds like our princess isn't exactly living in a "conventional" fairytale! Q: What makes your heart beat faster? A: I won't lie. Hot men. I like them. This sounds like a real treat, similar to scoffing a whole packet of Custard Creams! OOH I love that cover (not sure why I nearly always start with that comment lol - but it's true). Does make me think about what goes on "behind closed doors" of the royals, even if it is fiction. Sounds a great read. Love the cover! The book sounds awesome. Thanks for giving me a chance to learn about this book! :D I also enjoyed the interview, feels much more personalized somehow than just reading only a blurb and/or excerpt! I would like to give thanks for all your really great writings, including Once Upon A Time. I wish the best in keeping up the good work in the future.